Playlist is a project initiated by media artists interested in collaboratively authoring multi-threaded audio visual works. The project is comprised of three parts: the playListNetWork software developed in consultation with the artists, the audio visual media content made with the software and an interface to visualize and navigate the authored structure. playListNetwork is a distributed video editing database written in java that allows multiple users in different locations to simultaneously annotate media clips and edit branching playlists. A completely new architecture was designed and implemented by Tom Ritchford. My work for this project gave me a chance to research the current possibilities of interactive (web) media. We ended up using the open source Helix DNA Streaming Server. It serves many media formats and the files don't need to be hinted. We used SMIL to provide online video editing possibilies. SMIL is best supported by RealPlayer + we converted all audio visual media to sure stream real media. The nice thing about this is that the player and the server negotiate the bandwidth. This is	especially nice, because the size of the files playing in parallel via SMIL add up. We would have liked to use open source codecs like vp3 and ogg, but at the time of development these weren't supported yet by the player and/or server. Another nice thing could have been to generate MPEG-4 files from SMIL via XMT-O. IBM has developed some tools for this, but again at the time the licensing was unclear as about everything else concerning MPEG-4. Plugins to play MPEG-4 suddenly weren't available anymore, having to pay for specifications, complicated licenses, not allowing downloads of executables.... There's not much open about MEG-4 and it just seemed one big hassle. During the exStream residency I worked with Willy le Maitre, Eric Rosenzweig, Jaanis Gaarancs and Sonia Cillari on the public web interface. During this residency I mainly functioned as the "glue" between the several aspects of the project. I worked with Willy and Eric on the metadata scheme, with Sonia on the design and interaction design of the web interface, and with Jaanis on the realization of the demo. What I like about Sonia's design for the public web interface is her abstract solution for visualizing the video clips and sequences. Instead of having a bunch of media objects flying around in space, they form one object / organism. 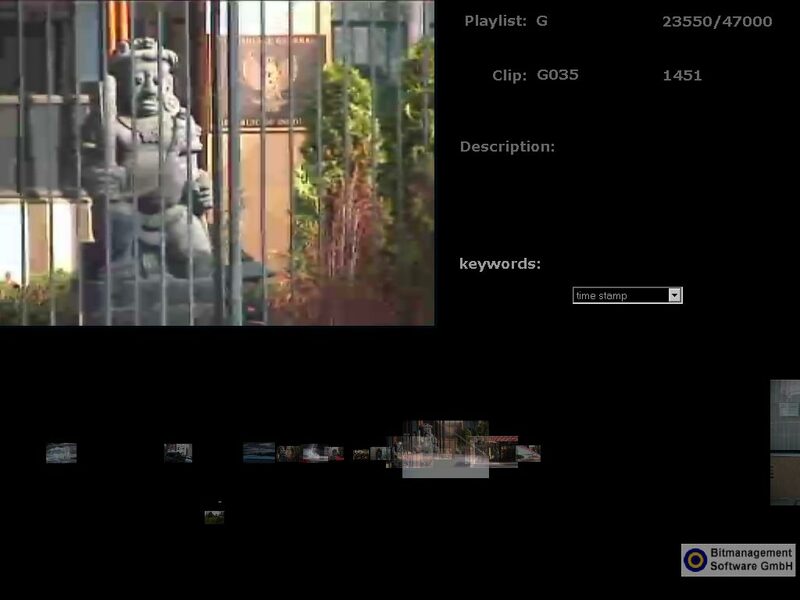 My favorite part is how the individual video clips in 3D space come to the front at the moment they are playing in the video window. This greatly enhances the whole user experience! This functionality is something we had wanted in Amicitia, but never got around to it. Thanks to Jaanis we now finally got to see it work!